2 Fat Nerds - Our First Crack at Food Prep! Our First Crack at Food Prep! 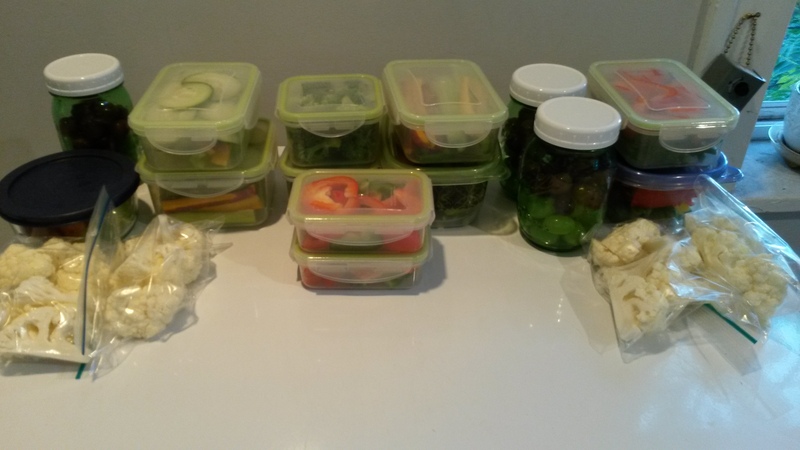 Home/Food, Health, Workout Tracking/Our First Crack at Food Prep! On Sunday, Jono and I took on the exciting task of planning out our breakfasts and lunches for the next three days. 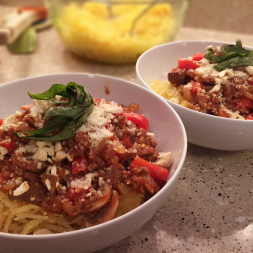 We didn’t really plan our dinners, minus picking up a few veggies and salad fixings, because we knew we were making Crock Pot quinoa chili that night and would have leftovers. The supplemental veggies are for when we’re sick of chili. We decided to shop for only about three days’ worth of breakfasts and lunches because we noticed that when we try to stock up for ten to twelve days, we end up throwing out uneaten, now-spoiled fruits and veggies. It’s sad and annoying. We don’t even have a compost bin where we can put these spoiled foods, so it’s literally purely wasteful. And stinky. Now, we’re no strangers to planning our meals. We just hardly ever stick to that plan. Like, ever. I blame a lot of it on trying to make menus for ten or more days. Inevitably we end up going out, not really wanting what’s on the menu, or coming up with some other excuse to deviate from what we wrote out. So, with a plan and a perfectly organized list, we filled our mini-cart. Shameless plug: the Wegmans app is ah-mazing. You make a list of what you need, then you punch in whichever location you’re headed to, and it organizes your list in the order you’ll walk through that store based on its layout. Mind. Blown. 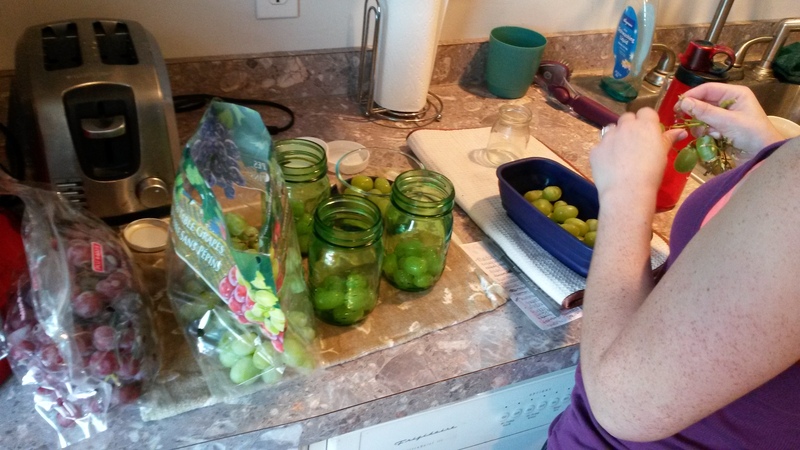 Evenly distributing the grapes! Jon was surprised that I was actually counting them out. Of course I was! Needless to say, shopping was a breeze. At home with our spoils (not spoiled spoils! ), we got started prepping immediately. I wrote out a day-to-day list of what each of us would get and started washing and chopping. The hardest part was getting everything organized. I combined the vegetables to save on containers, but it got a little confusing when putting carrots in the containers for Monday and Tuesday, celery in Tuesday and Wednesday, green beans in Monday and Wednesday, broccoli in a separate container for Tuesday and Wednesday, cauliflower in baggies for Monday and Wednesday . . . and so on. Once we got things labeled, it ran much more smoothly. So many containers. So many vegetables. After filling the refrigerator—and our breakfasts and lunches definitely filled it up—I took a sigh of relief. I’d been wanting to try prepping our meals and had been so scared to do it. I’d heard it was a time-consuming beotch. I didn’t think we had enough containers to make it worth it. I didn’t want to lose valuable fridge real estate to Tupperware. But it was worth it. I actually enjoyed washing the fruit and cutting the veggies (minus the time the knife slipped from that one carrot and got me right at my cuticle). Knowing that we will be eating this food and that it won’t be sitting in a crisper drawer, lost to eternity, makes me very happy. The only things we didn’t prep were the daily sandwiches (to avoid soggy bread from tomato/mustard/mayo) and the melons for later this week (to avoid drying it out or it getting gross in any way). This morning, I was much more relaxed knowing all I had to do was make a couple of sandwiches. I’ll take an hour or so a couple of times a week prepping over the frantic twenty minutes every morning shoving food into containers before we leave for work. Up until Sunday, that was the only thing we did. That, or the other, dreaded alternative: fast-food bagels. If you’ve been thinking about food prepping, I encourage you to try it! We’re doing small steps here with stuff we know we’ll eat and in quantities we know we can use up without any of it rotting. And if you’ve already been prepping, well then you already know how awesome it can be. I can’t stress enough how much I didn’t stress this morning. That in itself is literally what will keep me doing this. Oh, and we bought a Veggetti on Sunday. Total impulse buy, but I’ve heard great things! Mainly from Adrienne! I can’t tell you how excited I am to try this with the zucchini we bought. But first, to get through all that quinoa chili . . .